Αργήσαμε λίγο αλλά η 2η αποκλειστική συνέντευξη για το whiskyforum.gr είναι εδώ! Tον Peter Currie, "Pete" όπως τον λένε οι φίλοι του, τον έχω γνωρίσει προσωπικά σε εκείνο το θρυλικό 1ο Whisky Festival της Θεσσαλονίκης, όπως και κάποιοι άλλοι εδώ μέσα. Μου άφησε τις καλύτερες εντυπώσεις, ένας άνθρωπος που χαίρεσαι να τον βλέπεις και να τον ακούς, άνετος, φιλικός, με το χαμόγελο στα χείλη, με λόγο ελαφρύ αλλά τεκμηριωμένο που δείχνει γνώση, πάθος και μεγάλη αγάπη για τη δουλειά του. Ένας Σκωτσέζος, γεννημένος "μέσα στο ουίσκυ", νέος σε ηλικία με λαμπρό μέλλον μπροστά του, αλλά ταυτόχρονα με τεράστια εμπειρία και περγαμηνές. Ας δούμε τι έχει να μας πει, ελπίζω να βρείτε τη συνέντευξη ενδιαφέρουσα. Όπως και η προηγούμενη, έτσι και αυτή έγινε με τη μορφή ερωτωαπαντήσεων λίγο πριν τα Χριστούγεννα. Celtic: Well, Pete, first of all, tell me about your relationship with whisky in the first place and how you started working in the whisky business. Was it coincidental or did you actually pursue it? Pete: I followed my dad into the Whisky Industry. He worked for Gordon & Macphail, and from my mid-teens he was letting me try samples of old G & M bottles from distilleries like Rosebank, Glenlivet, Macallan, Ardbeg and Caol Ila. Once I graduated from University, I returned to Scotland and he heard about a job going at Loch Fyne Whiskies. It was the best education I could have had, working with a passionate team and selling whiskies from throughout Scotland. I was hooked after that. C: You’ve been working for Springbank Distillery in Campbeltown for a long time. What did you enjoy most from those days and what are the things you want to leave behind and forget (if there is any)? C: Was there a particular reason for leaving Springbank? P: It was just time. J & A Mitchell & Co are a very conservative and cautious company. This approach has kept them independent for 180 years so has to be admired. I had learnt a great deal working for them and the time was right to get out and look for new challenges, see other sides of the whisky business and learn how other companies operate. C: Cambeltown was once the “whisky capital” of the World, with more than 30 (if I remember right) alive distilleries. Is there anything nowadays in the town that reflects its glorious past? P: Campbeltown is a great place, with beautiful beaches and surfing, world class golf courses and great people. It has the community spirit of an Island, but without having to arrange your travel plans around ferry timetables and weather. In the last 10 years, Campbeltown has certainly had a facelift with a new distillery, swimming pool, golf course, two re-built hotels and a glorious new whisky bar in the Ardsheil Hotel. With Springbank, Glen Gyle and Glen Scotia distilleries all working, the whisky making traditions live on and as long as that continues, the glorious past is kept alive and can be built upon. C: Of all the lost (closed, mothballed etc.) distilleries, not only in Campbeltown but in the whole of Scotland, which ones would you like to see working again and why? P: I would love to see Glendarroch Distillery in Ardrishaig working, as it would have been impressive on the banks of the Crinan Canal. The casks from Lochside Distillery in Montrose I have been fortunate enough to taste have all been crackers, and it is under-rated compared to other closed distilleries like Port Ellen and Brora, so it would be on my list. Finally, I think Hazelburn Distillery in Campbeltown would have been a magnificent distillery when it was open. It was the biggest Campbeltown Distillery, with its own malt floors and was where Makataka Taketsuru, founder of Nikka in Japan, learnt to make whisky in the early 1900’s. It’s a great story and I would love to try a whisky distilled there. C: And which are your favourite distilleries generally? P: My favourites are the independents, who keep things interesting for whisky fans. I admire the owners of distilleries like Springbank, Glenfarclas, Isle of Arran, Benriach/Glendronach, Edradour, Benromach and Kilchoman. These guys make whisky for the love of it and are not afraid to do things their own way. 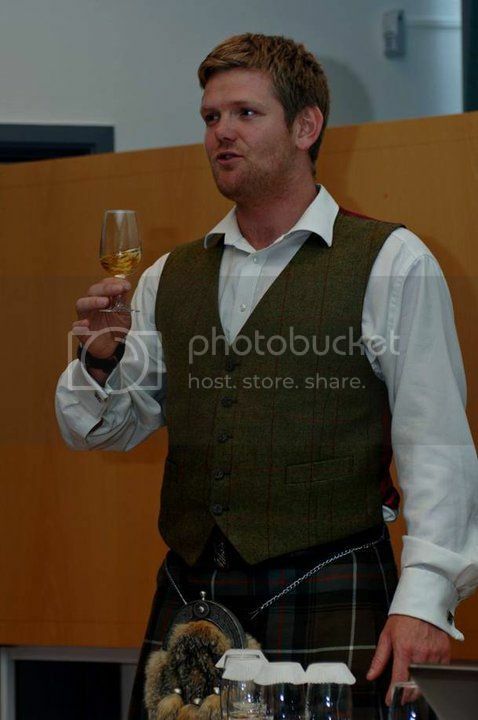 C: From all the whiskies you’ve ever tasted, name your best of the best, your top 5 let’s say, or as many as you like. 1. Springbank 1966 Local Barley – I’ve been lucky to try a large range of these, and they were all amazing. 2. Bowmore 1957, 38 year old. We had a bottle of this at Loch Fyne Whiskies, when I worked there with the wooden box and key. I longed to try it and I had the chance a few years ago, a truly great whisky. 4. Bunnahabhain 1968 Auld Aquaintance – I drank a bottle of this with my two best mates on Islay, having just survived my stag party. 5. Black Bull 40 – The first whisky we had after completing the move to California. 40 year old whisky for under $200, the price/quality ratio is ridiculously high, and I’m proud to work with this whisky. C: Your favourite Springbank? I assume you are familiar with most…. P: Again the local barley, or for a more reasonably price one I always loved the 10 year old 100 proof (57%). It was all in bourbon casks and had great balance. I was sorry when it was dropped from the range. C: When tasting a whisky for the first time, what are the main things you are looking for? And generally, when judging a dram, to which aspect of flavour do you give more attention? What makes a whisky really special for you? P: I have always been a whisky drinker who is lucky enough to work in the industry, so I just look for flavours I like or I think will be appreciated by the other whisky drinkers I meet. During my time at Springbank, I was one of the people who pushed for the Longrow Tokaji finish to be bottled as I liked it and thought it was distinct enough to get people talking. It wasn’t for everyone, but I still hear from people asking me to help them find another bottle. That’s what I love about this industry, there is no right answer. Taste is individual, and for every person who loves peat, there will be 100 more who can’t stand it. C: You are now working for the well known and respected independent bottling firm “Duncan Taylor & Co.” Is it more complicated, more challenging or what? And what specific subject do you enjoy most of your current job? P: Leaving an old family owned company like J & A, and joining Euan Shand and his family at DT, the first thing I noticed is that the pace is different. With J & A, everything was planned years in advance and change took time. Euan is always looking to react quickly to changes in the market, availability of stock etc. He also encourages us to actively pursue opportunities, which is why we have now set up our own import company in the USA. We are already starting to see traditional Single Malt markets like the US, Europe and the UK having their allocations of older whiskies reduced by the larger distillers, as markets like China and India grow. We have good stocks of old casks and are perfectly positioned to benefit. C: Apart from Duncan Taylor, which independent bottlers do you admire most? Which are the ones you feel like they are your strongest competitors? Duncan Taylor, Adelphi, Douglas Laing and A.D Rattray are probably the top Independent Bottlers, with companies like The Creative Whiskv Co and The Whisky Broker working on a smaller scale. Having said that, we all have whiskies from different distilleries/ages and whilst we are competitors, we are such a small part of the whisky business that we all get on, and even work together on occasions. C: As far as I know, you have moved in the U.S.A. What was the first thing that made an impression on you over there? P: The weather! After 8 years on the West Coast of Scotland, the move to California has been amazing for my family. I still can’t get used to it being sunny all the time. C: Did you find any differences regarding the “whisky attitude” of the people, between those in Europe and those in the other side of the Atlantic? P: I’ve been coming to the US to talk about whisky for the last 8 years, so I knew what to expect. The consumers here are knowledgeable and enthusiastic, and shows like Whisky Fest cater to these guys. The enthusiasm from Bartenders is a more recent phenomenon, where they are now looking offer as many whiskies as they can to their customers. The US has more and more ‘Japanese’ style whisky bars with hundreds and sometimes thousands of different whiskies behind the bar. C: Bourbon, Rye or Tennessee? What is the style of American whiskey that you prefer? Is there any particular bottling that made Pete say “Wow! This is an absolute stunner!” or so? P: The number of American Distillers has exploded in recent years, and one of the best things about attending shows is getting to try the results from both old and new distilleries, whether it be Rye, Bourbon, Tennessee or Single Malt. For me, it’s all about keeping the whisky market interesting and increasing education, which will hopefully benefit us all. C: Duncan Taylor has released some Octave and Quarter Cask bottlings. What was the acceptance from the market? From your personal experience, do such casks really accelerate the maturation process significantly? Do they also add something extra, regarding the tasting characteristics? P: The Octaves and Quarter casks work really well. We have found that younger whiskies (15 and under) take far more flavor from the Octave, whilst whiskies over 20 year old tend to take far less out the wood. The Octaves we are filling at the moment are all ex-sherry, and it adds a layer of depth and complexity to the whisky that wasn’t there before the Octave was filled. The Octaves are mainly sold to smaller stores who want an exclusive whisky, but would struggle to sell 200+ bottles. We also sell full Octaves to whisky clubs and festivals, bars and for weddings etc. C: “No bull, just whisky” is the slogan for Duncan Taylor’s blended whisky “Black Bull” which has gained general admiration and won several awards, especially the older versions (30 & 40 y.o.). What’s the story behind this ultra premium blend of yours? The secret of its success? C: Back in 2006, as a Brand Ambassador for Springbank, you have visited Thessaloniki for the 1st Whisky Festival in Greece. How did you find the whole thing? What are your memories from this event in our country? P: The event was great in a beautiful city full of lovely people. My main memory of that trip was that it felt like whisky ambassadors holiday. Normally we’re attending shows in Autumn and Winter, with the associated weather, but in Thessaloniki we all found ourselves having beers on the promenade in the sun, followed by a few drams at the show. What more could you ask for! C: And what about all the rest whisky festivals you’ve been globally? Which one was the one you’ll never forget and why? Also, is there any particular annual whisky festival that you don’t want to miss, that you are eager to attend every time? P: The Universal Whisky Experience in Las Vegas at the start of March. All the brand ambassadors, distillers and bottlers are opening their best bottles, and you always find something amazing and memorable. You also get to meet and have a drink with the visitors, as we’re all staying in the same hotel. C: Suppose you were in an isolated village, somewhere far north, desperately seeking a dram. The local minimarket store offers just the following standard blends (Johnnie Walker, Bell’s, Cutty Sark, Famous Grouse, JeB, Ballantine’s, Teacher’s, Whyte&Mackay, Grant’s, Dewar’s, Haig, White Horse and ..Jameson). What would you pick? P: In the absence of Black Bull 12, it would be Teachers for me, a great Blend with a high malt content and slight hint of smoke. I just wish it was bottled at higher than 40% ABV. C: What’s the funniest thing, related to whisky, that you recall from all those years in your life? P: There are so many, and more than a few that can’t be mentioned. As I mentioned earlier, I went to Islay for my Stag Party, and just before taking a tour of Bruichladdich with Jim McEwan, my ‘friends’ dressed me up in a Borat Mankini. C: Are you fond of any other spirits? Wine? Beer? Do you fancy something else rather than whisky every now and then? P: I’m also a big fan of craft brewers. In Scotland, my favourite is Fyne Ales, however now that I’m in California, the choice is staggering. I’m actually heading to San Diego this weekend to visit some breweries. I also really enjoy well made rum, and I’m a big fan of Diplimatico from Venezuela. Duncan Taylor has just bottled a range of aged Cask Strength, Single Cask Rums, which we’ll be releasing within the next few weeks, so keep you’re eye out. C: Whisky prices today, are they justified? Let alone the “Manager’s Choice” series from Diageo which is the perfect example, we see on the market many non-age statement expressions that cost more than standard 12 year olds. We see large price fluctuation between similar expressions from different distilleries/companies. Take for instance the Glenfarclas 40y.o. and the just released Old Pulteney 40y.o. … I’m thinking that we have reached a point where collectors rule and a lot of companies set prices however they like, not taking into account the actual production cost. P: There are a lot of considerations that need to be taken into account when setting prices. Firstly, distillers base their prices on the cost of replacing a cask of whisky, not of the cost of making it 10/15/20 years ago. Barley, Oil prices tend to only go one way. Secondly, you have to consider availability. If a company has a large stock of old whisky, then they will be able to keep the prices low to move the volume, however no-one wants to be the guy that sells the family silver too cheaply, and is left with only a 10 year old in the range. I experienced that at Springbank, when the 21 year old sold out, and it can really damage your company’s reputation. In that situation is more prudent to gradually increase the price to slow demand. Collectors also play a part, however even this market has changed dramatically in the last 10 years. China/Russia/India have joined the hunt, particularly for old Macallan, Bowmore etc. The market is getting bigger as the stocks decrease and this will drive prices up. I can’t speak for Glenfarclas or Diageo, as I don’t know the stocks they have at these older ages, however I can tell you that the prices of any cask over 20 years old is being driven higher and higher on the open market. Everyone knows the bottle value of their stock, Independent Bottlers are trying to secure their future supply, the big blenders need the whisky for their old blends and investors want a piece of the action. All of this in an ever tightening market only means one this for prices. C: Whisky sales are booming and new distilleries are established during the last years, due to the fact that countries such as India and China are growing fast. Despite that, and considering the recession of the developed countries of the West, do you feel that there will soon be a “whisky crisis”, just like in the past? P: The whisky industry always goes in cycles of boom and bust. We are currently in a boom and I can’t see it ending any time soon. The world is getting smaller and the potential growth in the new markets will drive growth for the big blends. The possibility of recession in the west could lead to a reduction in Blend sales (Spain etc) however when you consider that Single Malt is also only 7-8% of global whisky sales, I think it’s likely that in mature markets, distillers will continue to educate consumers, and enough of them will switch from Blends to Malts. This will increase value of Scotch sales and compensate for the loss of volume. Smaller distillers will hopefully continue to thrive, and I’m sure we’ll see more success stories like Bruichladdich. C: As you are a native Scot, I’d like to know your thoughts regarding Scotland’s independence, an issue that’s being discussed more and more lately. P: I’m all for independence, as I think that, given time, an independent Scotland would eventually thrive. The first law I would hope to see passed is that a distillery should never be allowed to be closed/demolished if there is any possibility of finding another buyer, including a community buy-out. Distilleries are the heart of their community, create employment and can shape an entire town. If the owners can’t make a profit with them, they should be given to someone who can. C: Pete, I happen to know that you like surfing. Are there any other activities/hobbies occupying your free time? P: Other than surfing and drinking whisky, I also like mountain biking, snowboarding and I’ve been known to have the odd game of golf. C: And last, which whisky from the latest (2012) releases, would you like Santa to bring you this Christmas? P: The whisky that caught my eye this year was the blend that Suntory put together for the Rolling Stones 50th anniversary. I haven’t tasted it, but the bottle is so cool that I actually debated trying to buy one. On behalf of whiskyforum.gr and HMWS, Slainte Mhath! P: You're welcome Chris. And I'd like to finish by wishing everyone in the forum and the Hellenic Malt Whisky Society a successful 2013, I hope that this is the year all your 'drams' come true. Κέλτη, άλλοι θα έβγαζαν λεφτά από τέτοιες συνεντεύξεις. Well done mate! Εξαιρετικη συνεντευξη,με ουσιαστικες ερωταποκρισεις που αγγιζουν πολλα και ενδιαφεροντα θεματα,ετσι για να βλεπουμε και λιγακι πως σκεφτονται και αναλυουν τα πραγματα οι επαγγελματιες του χωρου.Παρα πολυ καλη και κοπιωδης δουλεια,χιλια μπραβο!!! Ευχαριστώ παιδιά, τα εύσημα όμως ανήκουν κυρίως στον Pete, ο οποίος με τις πλούσιες απαντήσεις του έδειξε οτι σέβεται και εμένα προσωπικά αλλά και όλους εσάς, το φόρουμ γενικά. Δεν αντιμετώπισε την όλη φάση ως μια αγγαρεία ή ξεπέτα αλλά εντελώς επαγγελματικά, παρόλο τον ελάχιστο πολύτιμο ελεύθερο χρόνο του. Είναι χαρακτηριστικό οτι το ερωτηματολόγιο το είχα στείλει κάπου στα τέλη Νοέμβρη και παρά τις κάποιες "ενοχλήσεις" που του έκανα γιατι ήθελα να δημοσιευθεί πριν τα Χριστούγεννα, εκείνος μου απάντησε οτι δεν θέλει να ανταποκριθεί με πρόχειρο τρόπο αλλά οι απαντήσεις του να είναι πλήρεις. Έτσι, τις έλαβα μόλις προχτές και διαπίστωσα κι εγώ οτι άξιζε και με το παραπάνω η αναμονή. πολυ καλή δουλειά Χρήστο, έκανες μεγάλο κόπο και σου βγήκε ένα πάρα πολυ καλό αποτέσμα! τα ευσημά μου! ΕΞΑΙΡΕΤΙΚΗ "δουλειά+ - αδόκιμος ο όρος αφού μάλλον για σένα είναι το απτό αποτέλεσμα της αγάπης σου για το malt και φυσικά το forum και την HMWS. Πολύ καλή και η ανταπόκριση του Peter και ιδιαίτερα ενδιαφέρουσα η ανάλυσή του για τις τιμές πώλησης όπου αναλύτεται ο τρόπος σκέψης του "παραγωγού" με ιδιαίτερη ενδιαφέρουσα την ανάγκη διατήρησης αποθεμάτων για να μην χάνεται από το range ενός αποστακτηρίου η εμφιάλωση malt μεγάλης ηλικίας (η διατήρηση μίας συνέχειας πζ από 40άρια και όχι η αποσπασματική εμφιάλωση και μετά η εξάντλησή του). Μπράβο κέλτη. Έσκισες ομολογουμένως. Πως τον έπεισες να συμπληρώσει τόσο μεγάλο (και εξαιρετικά εύστοχο - ξανά μπράβο) ερωτηματολόγιο (σκεφτόμουν ότι αν κάποιος μου έστελνε τόσο μεγάλο ερωτηματολόγιο για την δουλειά μου, θα τον απέφευγα με τρόπο...).